WEST LAFAYETTE, Ind. - A team of Purdue University researchers is among a small group in the world that has successfully created ultrapure material that captures new states of matter and could have applications in high-speed quantum computing. The material, gallium arsenide, is used to observe states in which electrons no longer obey the laws of single-particle physics, but instead are governed by their mutual interactions. Michael Manfra, the William F. and Patty J. Miller Associate Professor of Physics who leads the group, said the work provides new insights into fundamental physics. "These exotic states are beyond the standard models of solid-state physics and are at the frontier of what we understand and what we don't understand," said Manfra, who also is an associate professor of both materials engineering and electrical and computer engineering. "They don't exist in most standard materials, but only under special conditions in ultrapure gallium arsenide semiconductor crystals." Quantum computing is based on using the quantum mechanical behavior of electrons to create a new way to store and process information that is faster, more powerful and more efficient than classical computing. It taps into the ability of these particles to be put into a correlated state in which a change applied to one particle is instantly reflected by the others. If these processes can be controlled, they could be used to create parallel processing to perform calculations that are impossible on classical computers. "If we could harness this electron behavior in a semiconductor, it may be a viable approach to building a quantum computer," Manfra said. "Of course this work is just in its very early stages, and although it is very relevant to quantum computation, we are a long way off from that. Foremost at this point is the chance to glimpse unexplained physical phenomena and new particles." 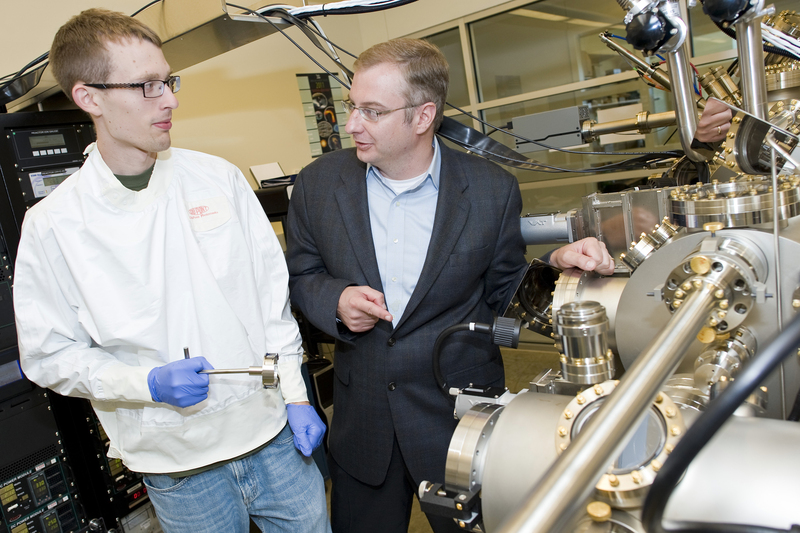 Manfra and his research team designed and built equipment called a high-mobility gallium-arsenide molecular beam epitaxy system, or MBE, that is housed at Purdue's Birck Nanotechnology Center. 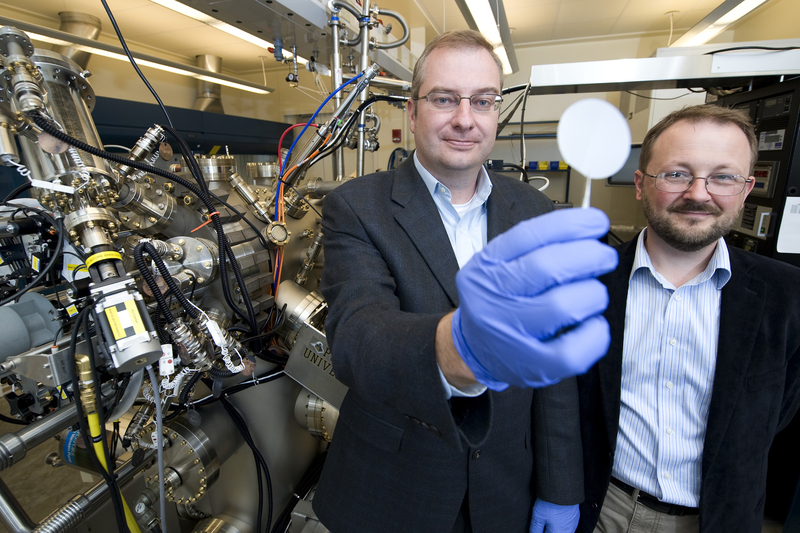 The equipment makes ultrapure semiconductor materials with atomic-layer precision. The material is a perfectly aligned lattice of gallium and arsenic atoms that can capture electrons on a two-dimensional plane, eliminating their ability to move up and down and limiting their movement to front-to-back and side-to-side. "We are basically capturing the electrons within microscopic wells and forcing them to interact only with each other," he said. "The material must be very pure to accomplish this. Any impurities that made their way in would cause the electrons to scatter and ruin the fragile correlated state." The electrons also need to be cooled to extremely low temperatures and a magnetic field is applied to achieve the desired conditions to reach the correlated state. Gabor Csathy, an assistant professor of physics, is able to cool the material and electrons to 5 millikelvin - close to absolute zero or 460 degrees below zero Fahrenheit - using special equipment in his lab. "At room temperature, electrons are known to behave like billiard balls on a pool table, bouncing off of the sides and off of each other, and obey the laws of classical mechanics," Csathy said. "As the temperature is lowered, electrons calm down and become aware of the presence of neighboring electrons. A collective motion of the electrons is then possible, and this collective motion is described by the laws of quantum mechanics." The electrons do a complex dance to try to find the best arrangement for them to achieve the minimum energy level and eventually form new patterns, or ground states, he said. Csathy, who specializes in quantum transport in semiconductors, takes the difficult measurements of the electrons' movement. The standard metric of semiconductor quality is electron mobility measured in centimeters squared per volt-second. The group recently achieved an electron mobility measurement of 22 million centimeters squared per volt-second, which puts them among the top two to three groups in the world, he said. Manfra and Csathy presented their work at Microsoft's prestigious Station Q summer meeting on June 17 at the University of California at Santa Barbara. This meeting, sponsored by Microsoft Research, brings together leading researchers to discuss novel approaches to quantum computing. They also received a $700,000 grant from the Department of Energy based on their preliminary results. In addition to Manfra and Csathy, the research team includes associate professors of physics Leonid Rokhinson and Yuli Lyanda-Geller; professor of physics Gabriele Giuliani; graduate students John Watson, Nodar Samkharadze, Nianpei Deng and Sumit Mondal; and research engineer Geoff Gardner. "A broad team is necessary to probe this type of physics," Manfra said. "It takes a high level of expertise in materials, measurement and theory that is not often found at one institution. It is the depth of talent at Purdue and ability to easily work with researchers in other areas that made these achievements possible."